The ActiveWrap BAWK005 hot/cold knee wrap is the ideal therapy tool that offers compression and extended relief. It provides both hot and cold treatment in an easy to use design. It's the mess-free, reusable answer to your therapy needs. The BAWK005 hot/cold knee wrap is equipped with plush compression straps that can be spiraled around the support for focused treatment. The specially formulated heat and ice packs allow for a fully customizable therapy experience specific to your knee condition. The ActiveWrap BAWK005 hot/cold knee wrap brings maximum pain relief and helps treat inflammation from knee pain caused by knee dislocation, knee fracture, knee arthritis, prepatellar bursitis, tendonitis, patellofemoral stress syndrome, as well as after surgery pain and swelling. By using the ActiveWrap Knee Wrap, you can enjoy the following key benefits: Lightweight and comfortable pain relieving solution. Excellent therapy for the calf, shins, knee, quads, and hamstring applications. Perfect for after knee surgery rehabilitation to aid with a speedy recovery. Includes 3" wide plush compression straps and two ice/heat packs. Additional packs (BAWP004) available for purchase. Small/Medium (BAWK005) fits under 18". Large/XL (BAWK006) fits over 18". Extra Wide (BAWK007) fits over 25" and holds three ice packs for full knee ice therapy. PICK THE CORRECT SIZE - Size Small / Medium fits thigh circumference below 18 inches. Size Large / XL fits thigh circumference between 18 and 25 inches. IMPORTANT: Measure circumference of thigh 3 inches above knee. 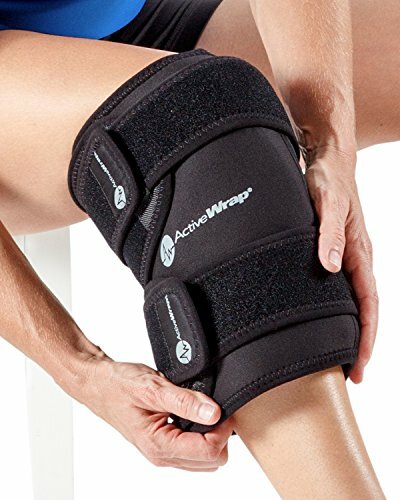 REMOVABLE GEL PACKS - ActiveWrap hot / cold knee wrap comes with 2 reusable therapy gel packs that can either be frozen or heated to treat a particular knee pain or injury. Use cold therapy for recent knee pain or injuries to help reduce inflammation. Use heated gel packs for chronic pain and stiffness in joints or muscles. Reusable gel packs allow for customizable hot / cold therapy for knee pain relief. Additional gel packs may be purchased (BAWP004 , 7" x 10"). SPECIFICALLY DESIGNED FOR THE KNEE - Patented design built by physical therapy professionals. Built with comfort and precise functionality. The ActiveWrap hot / cold compression knee wrap provides therapy and support for knee injuries. Made with the finest quality elastic material without any harmful chemicals. BENEFITS - Prevent further joint & muscle inflammation or injury. Increases recovery time for knee injuries. Ideal for knee sprains, knee strains, swelling, post knee surgery therapy, arthritis, and more. Also great for athletes and individuals that are involved in activities that may put extra stress on knees: runners, walkers, hikers, cyclists, etc. GUARANTEE - Formulated and tested by physical therapy professionals. All ActiveWrap products come with a one-year guaranteed warranty. Hassle free. ActiveWrap also guarantees comfort and quality to all its consumers. FDA registered, and approved medical-grade product. No Leaks and no mess. Consistent hot & cold therapy with no areas being left untreated. If you have any questions about this product by AW ACTIVEWRAP, contact us by completing and submitting the form below. If you are looking for a specif part number, please include it with your message.